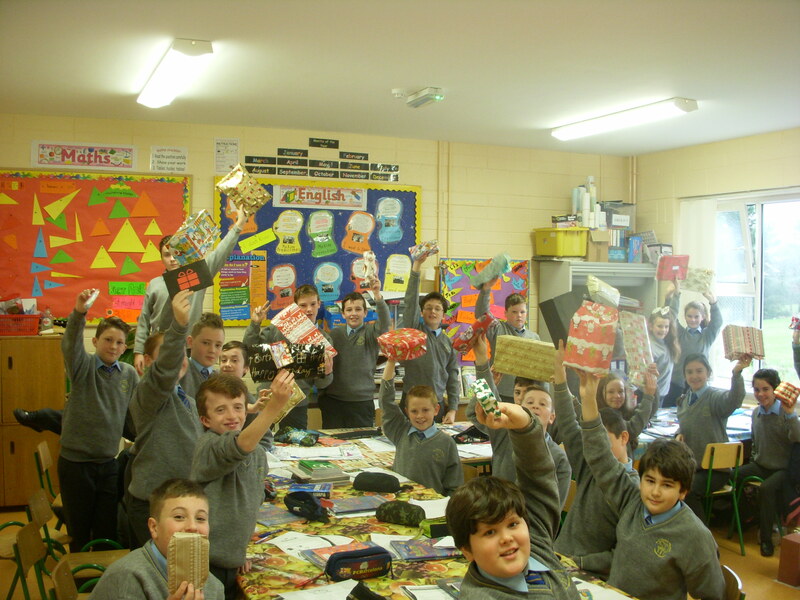 The children in 6th class had a lovely time in the weeks leading up to Christmas. 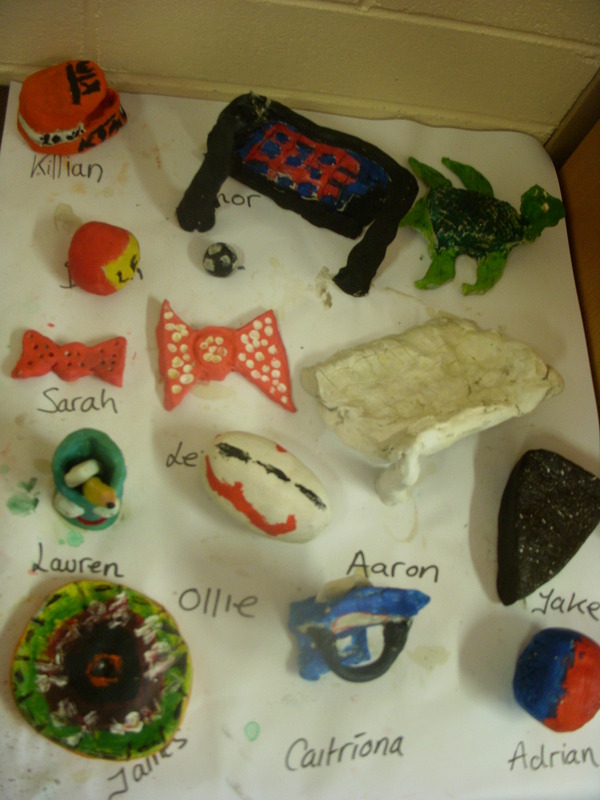 The children made Christmas baubles, cribs and painted Santa Claus heads using their hand prints. 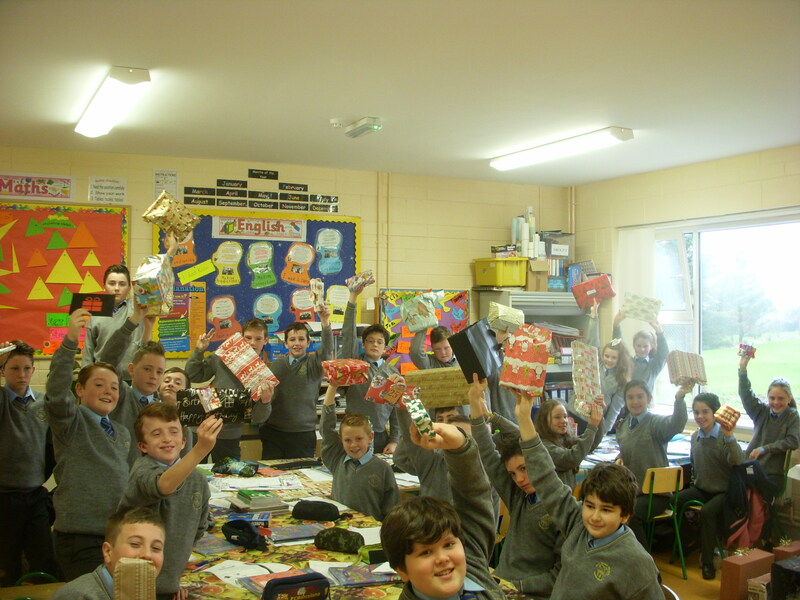 The children also participated in a ‘Secret Santa’ where the children were given a budget of 5 euro to spend on each other. 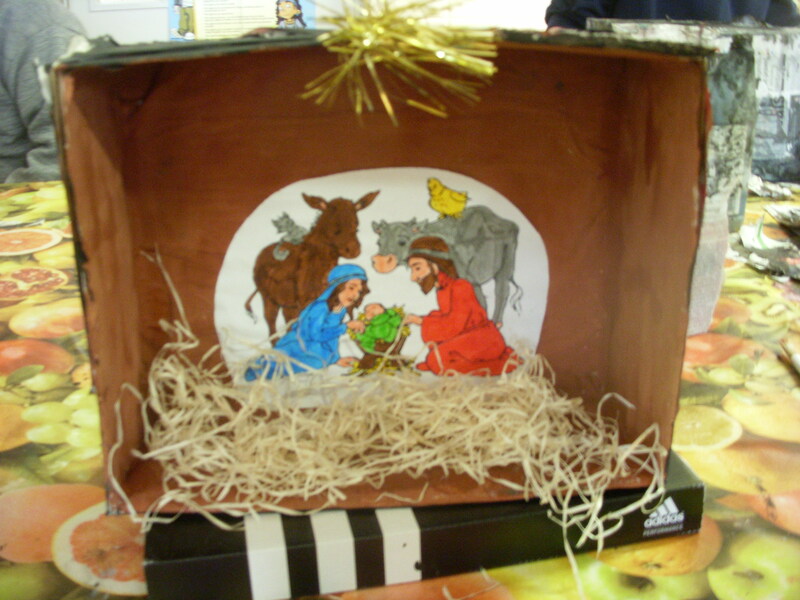 It was a great success and really created a lovely sense of giving in the classroom. The children gave generously today during the Christmas jumper day which was great to see. 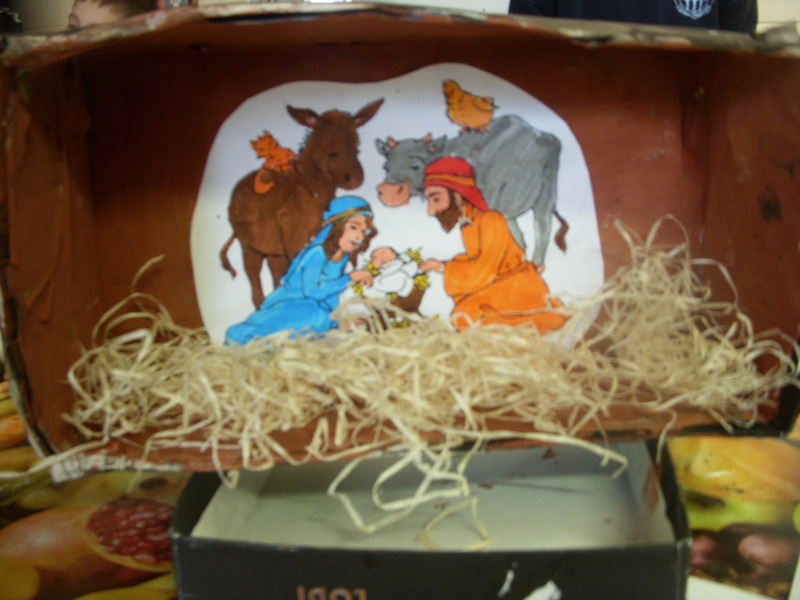 I wish every child and their families a safe and happy Christmas time. Thank you all so much for the lovely gifts as well. Kind regards, Mr. O’Sullivan . 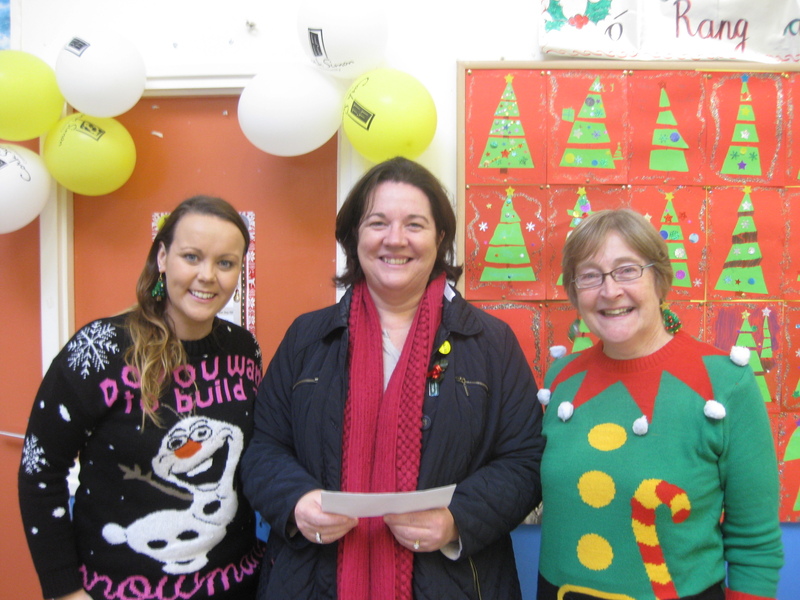 Well done to our boys and girls on raising a fantastic sum of €830 this morning for the Christmas Jumper Appeal. 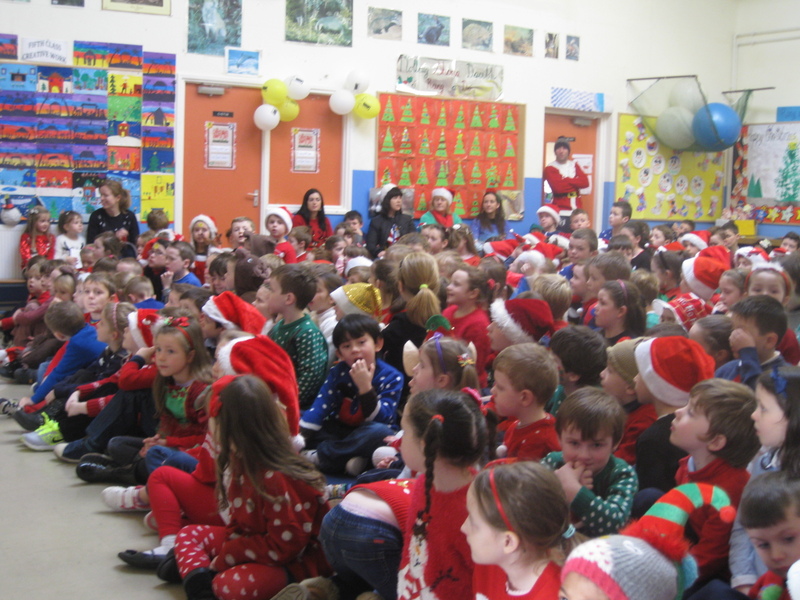 Siobhán joined us to sing Christmas songs and Marney from the Cork Simon Community told us where our money would be spent to help the homeless in Cork. A big thank you to Ms. O’Halloran for her organisation. This morning wouldn’t have been possible without her hard work! ON Friday 19th December, Scoil Naomh Micheál will take part in a “Cork Simon Christmas Jumper Day” Fundraiser to help raise money for this charity to buy much needed blankets and food for the homeless people in Cork city. Children will wear Christmas jumpers or dress in festive colours while making a donation to this worthy cause. The presentation of the monies raised will be made on the day also. 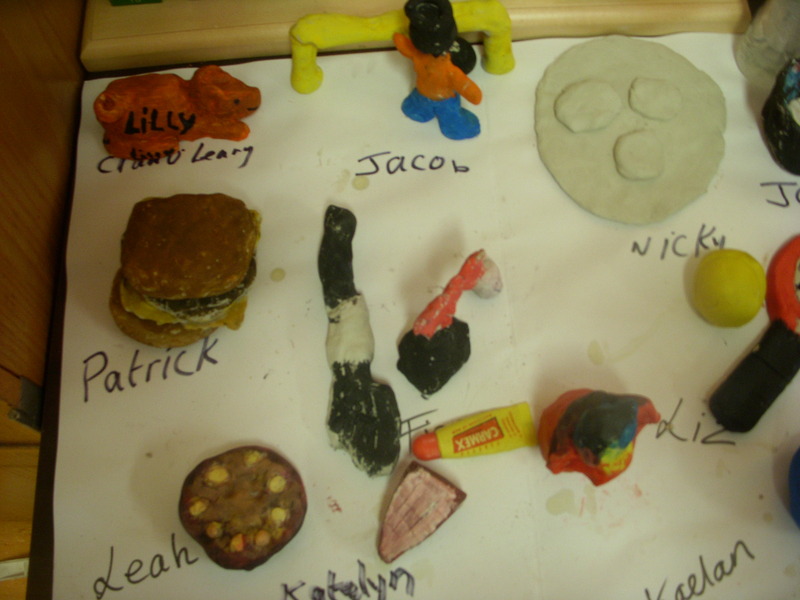 Sciath na Scol Final Stories from some 6th class children. On Monday we had a Sciath na Scol final. We trained so hard before the final match. It was played in Páirc Uí Chaoimh. The kick off was at 12 mid-day on November the 17th. I played forward for my team. Our trainers were Mr. Scanlon and Mr. O’Sullivan. Finbar came along to help us too. We had a great win and we were so excited because the boys hadn’t won a Sciath na Scol final in 12 years. On the 17/11/14, we played our Sciath Na Scol final. 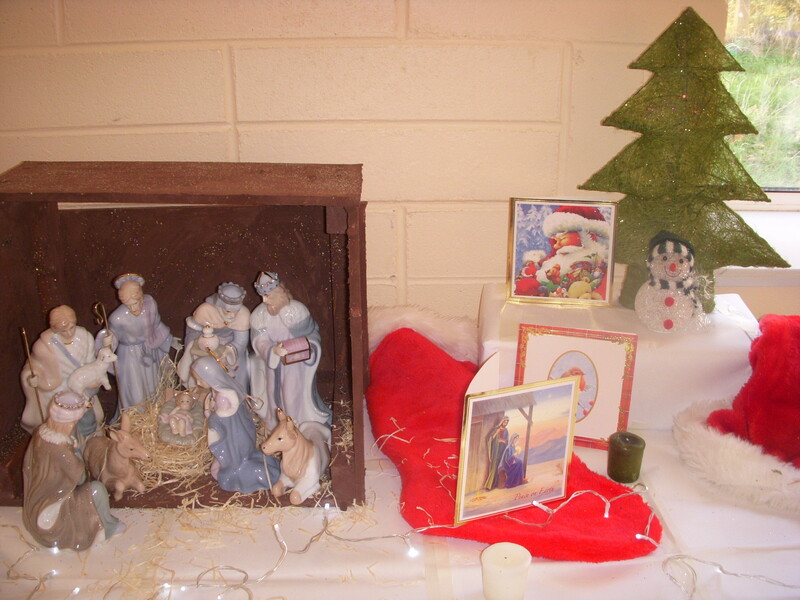 It was placed in Páirc Uí Chaoimh. We left on the bus at about 11:00am . By the time we were at Páirc Uí Chaoimh everyone was excited and nervous at the same time. When we got into our changing room our coaches Mr,O’ Sullivan , Mr. Scanlon and Finbarr spoke to us about the match . So when we were all ready we went out to the pitch. As we walked onto the pitch our school and some supporters cheered and encouraged us. We started doing warm-ups. While we were doing our warm-ups a man came over and said “it’s time for our names to be called “ , we all started to line up starting from one to thirty five. I was number twelve, beside me was Fionn who was number eleven and Seán was number thirteen. When they called my name I did a pose of today’s generation. After that we took a photo of our team. Then it was time, all the supporters were excited, I was excited , everyone was excited . The match started. I stood at the side of the pitch as I was a sub. We played Rathduff who got the first goal. I got annoyed, it came to a draw twice. In the second half we came on a bit. I came on for the last five minutes and on the very last forty seconds Fionn Hickey, captain, no.11, passed me the ball. The goal keeper ran out towards me but Kaelan and I ran into him by accident and he fell. The goalkeeper dragged me down with him but as I was falling I kicked the ball and it went into the goal! The whistle went one second later and I was screaming with delight. I ran towards the other players on my team as they ran towards me and we were the happiest boys in the world at that time. If it wasn’t for the help from Mr. O’ Sullivan, Mr. Scanlon and Finbarr we wouldn’t have won so I’d like to thank you as well. On the 17/11/14 we were in the Sciath Na Scol final, we got to play in Páirc Uí Chaoimh. All of the boys and girls were delighted we got to play here because it is such a big and famous venue. Both boys and girls had been training so hard for this day. The match was supposed to be on Tuesday last week but it was changed to Thursday as it was pouring rain. It had to be changed to Monday which was yesterday. I woke up refreshed as ever although I woke a little early because I couldn’t sleep any longer. I ran down stairs and ate my Weetabix to get me pumped up for the game. After I went upstairs and got ready and was out the door by 8:50. When I got into school Mr. O’ Sullivan, our teacher, was giving us all a prep talk, to get us ready for the game. We got on the bus at 11:00 and headed to the stadium. When we were on the bus it gave us time to relax and get prepared for the game. We all got off the bus and headed for the dressing rooms. We got ready nice and quickly so we could do our warm up then we all had to line up and our names would be called out. We would have to wave to the supports. Shortly after that, the game had begun. I was on the bench for the first half. The first half was very intense and unfortunately the opposition were up two goals. The starting team all huddled up to have a team talk at half time while the subs got to practise passing and shooting. Suddenly our team scored three goals in a row and we just started to dominate the rest of the game. The coaches finally put me on for the last few minutes with Cian O’leary. It was so close to the end and Cian O’leary scored a great goal. The final whistle blew and we all celebrated across the pitch jumping up and down with great excitement. After the match we got our medals and watched the girls’ game which they sadly lost. What an eventful day that I will remember forever. On Monday the 17/11/14 we had are Sciath na Scol final. We got the bus to Páirc Uí Chaoimh at 11 o’clock. When we got to Páirc Uí Chaoimh we got to watch the first half of the boys match. After half time we went into the dressing room with our coaches Ms Healy and Ms O’Halloran. We got ready, did some stretches and it was time to go on the pitch. Liz and Caitríona were the captains. The referee blew the whistle for the captains to go in for the toss. We lost the toss so we were playing against the wind. 5 minutes later the match started. At half time the score was 4-3 – 1-2. The final score was 5-4 – 1-5. We lost the match, we were very upset, but we got over it in the end. Our Sciath na Scol final was on Monday the 17th of November. The boys match was on at 12pm and our match was on at 1pm. All of our school left at 11am. It took about a half an hour to get to Páirc Uí Chaoimh. All of the girls, other classes, teachers, people who don’t play and parents were watching the boys. At 12.55 pm we had a team talk and Ms. Healy and Ms. O’Halloran told us our positions. I was corner forward. When we started the match I was a bit nervous at the start but I was ok after a few minutes. At half time we scored 1 goal and 2 points and Dunderrow scored 4 goals and 1 point. When we went back onto the field we scored a point straight away. Then one of Dunderrow’s corner forwards tried to score a goal but our goalkeeper blocked it with her head. Ouch! By the end of our match we had scored 1 goal and 4 points and Dunderrow had scored 5 goals and 4 points. We had lost at the end and we were all really upset but we enjoyed getting to the final and playing all the other matches. Rang a Sé- Polygon fun designs! 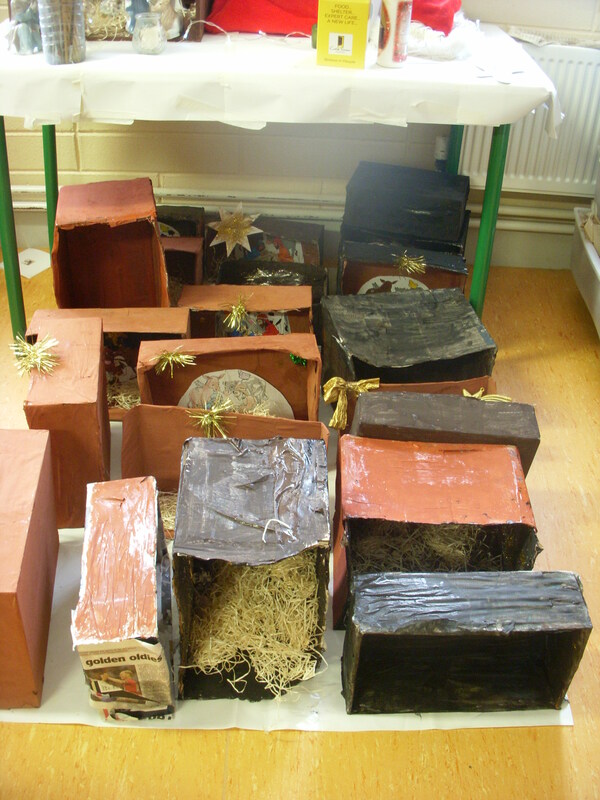 More examples in Mr O’Sullivan’s page. 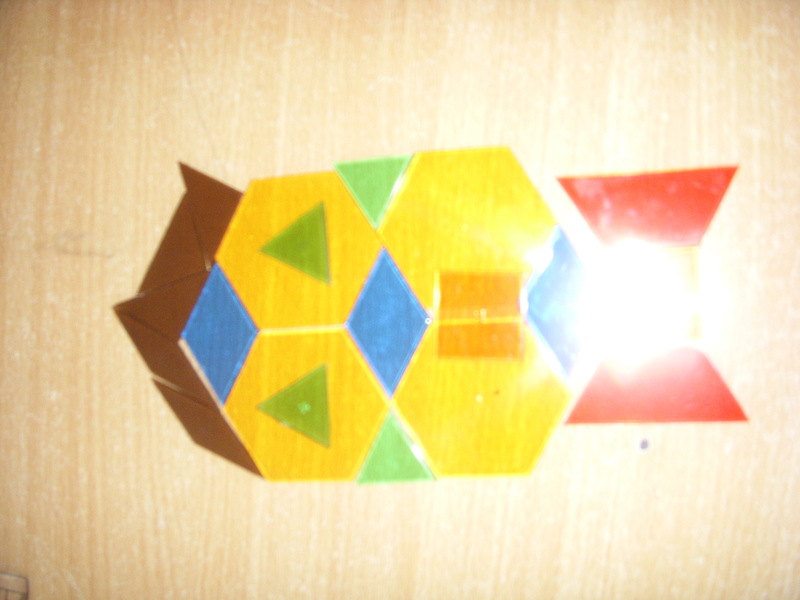 Killian created a face using 2D shapes. 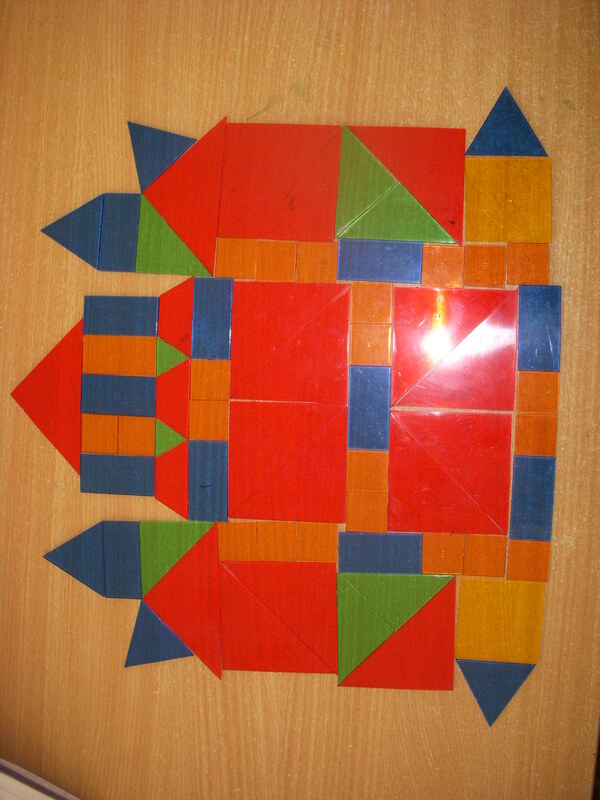 Cian O’L and Adrian designed this 2D shaped palace! 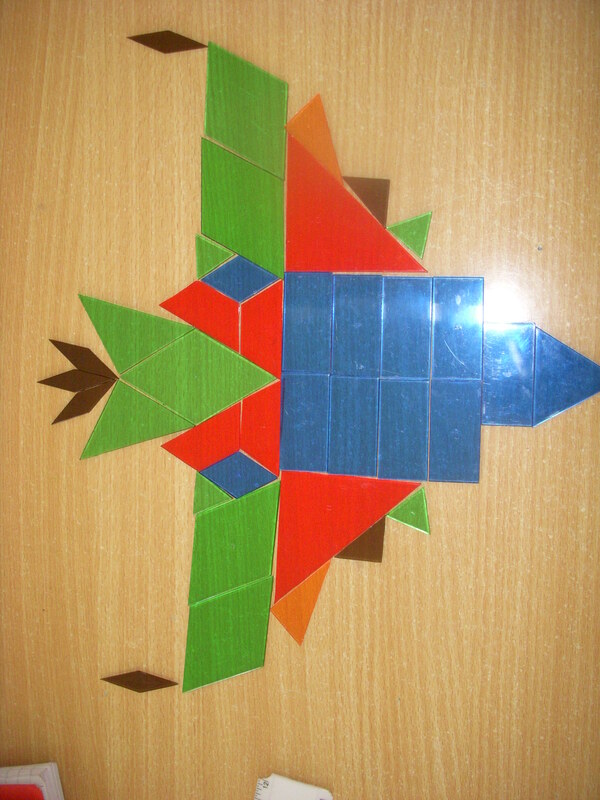 David and Kaelan designed and created this dramatic piece of art!